How many people can say that they are able to go island hopping less than an hour drive from their house? How many people get to explore tiny, remote and practically uninhabited islands when they are bored on a Saturday? Unless you live in Hawaii or another tropical area, I'm guessing that those scenarios are not the norm for you. One of the perks of living in Japan is that it is a chain of islands - one country made up of 6,852 tiny islands (to be exact)! Okinawa is just one of these islands, and there are hundreds of others within a ferry ride of us - some are inhabited, while others are not (completely in their natural state). While Matt and I plan to visit a bunch of these islands eventually, the only ones we've been to so far have been reachable by car. 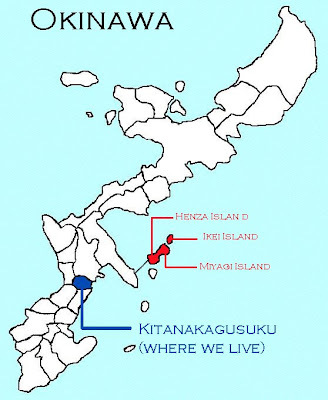 Henza, Miyagi, and Ikei (pronounced "eek-ay") Islands are connected to the east side of Okinawa by a man-made "land-bridge" (longest bridge on Okinawa), and they are connected to each other by regular bridges. Set out in the Pacific Ocean, these islands are about a 45 minute ride from our house, and they offer a quiet "get-away" from the crowds and traffic of everyday Okinawa. The first of the 3 islands, Henza, is not too interesting, as it is primarily used for housing the large petroleum plant located there. Continuing on, however, Miyagi island is much prettier, with a lot of lush greenery and quiet little villages. You are able to cross the island through the center (which goes up to the top of the hills), or you are able to go around the island on its coast, which is a gorgeous drive! We drove around the coast on our way out there, and through the hills on our way back. Atop the hills of Miyagi Island, there are still some neat views, but many more villages, sugarcane fields and little gravel "roads" that whip and wind, but eventually come back down. Ikei island is the last connected island, and the smallest of the three. It is famous for the red bridge that connects it to Miyagi Island, and beside sugarcane fields, the only things you will find on Ikei are a couple dive spots, some gorgeous views and beaches, and one resort. On our way out to this little chain of islands, Matt and I stopped off onto another area we found that was uninhabited and had some great views of the ocean. We went on a little hike around this area and ended up finding an honest-to-goodness, real-life cave! I'm talking stalagmites and stalactites and everything! It looked like the opening to the cave may have also been used as some sort of shrine or worship place by the locals. The cave was deep and very dark, and I was nervous to go any farther than about 20 feet in! Still, it was something you don't find everyday! I think we are going to try to go camping here next weekend - I'll be sure to share the experience with you if we do! I'm just beginning to read your blog. First thought, This always helped me remember the difference. Stalactites grow down from the ceiling and you can remember by thinking they hang tight. Whereas the stalagmites might reach the ceiling if they continue growing up. The key is tight and might! WOW!! Looks like you two are living it up out there! Love reading about it, Cortnie, and I laughed out loud at Matt's narration for the video.. Miss you guys! !